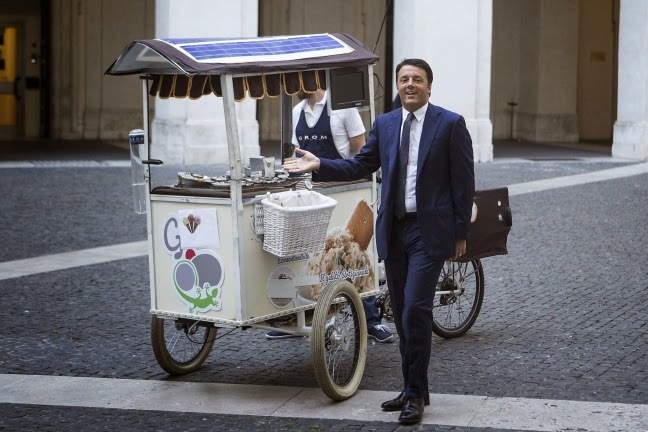 As news of Italy entering a Triple-Dip Recession came in on the economic front, Italy's Prime Minister Renzi decided to celebrate by offering scoops of gelato to the clearly stressed & distressed employees of Palazzo Chigi, the seat of Italy's President. Citing that they "Only earn 2.4 times the salary of Barack Obama," they needed some cheering up. After all, Renzi continued, "To get a triple dip is as difficult as those triple flips dynamic gymnasts do at the Olympics. My people work hard to get us where we are today. 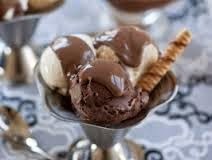 It takes guts to gut a country - just see what Silvio did - so here's some buon gelato helping to help those who need it least." A Renzi spokesperson added, "We're humanizing government. These poor State employees have to face 'il rientro' from their 6-week holidays. It's tough the first day back. I mean, the traffic! Our poor chauffeurs! It's a jungle out there." Since his ice cream man stunt which was lampooned across social media left, right and center, Italy has since entered into a full-scale depression. In response, Renzi, for his part said, "Depression? Isn't that the lovely recess where they put those lovely scoops of ice cream to make a fabulous sundae? Sounds delizioso!" Despite all the criticism, people close to the Prime Minister remarked: "I'd rather see ice cream dished out here in cones than lathered upon call girls or another sort of cone in the private quarters of our Last Emperor, Silvio." And, in case you're wondering where he got the inspiration, click here to hear Paolo Conte's excellent song, Un Gelato al Limon.